An international expedition to visit the world’s highest caves is underway in the Andes mountains of Peru. The team, made up of cavers from Canada, Australia, New Zealand, and the UK, departed on their six week long adventure in late September. Split into two parts, the first three weeks of the expedition will be spent in the Cajamarca area in northern Peru, where in 2010 a sinking river was located. Meanwhile, the final three weeks will take the group to the area around the Puyo valley to continue explorations of caves started during earlier expeditions. To check in with the progress and follow along the remainder of the trip, which continues until the beginning of November, visit the expedition journal at peru.commscentral.net. 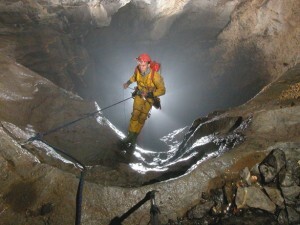 Update: The expedition rewrote the list of the world’s highest caves. How high, Andy? The caves at Nam Co (North of Lhasa), Chagong Chimu (Big Cave, above Nilong village, West of Lhasa) and Perochi (on the approach to Rongbuk) are all above 4500m. They are all pretty boring though, nowhere near as interesting as yours! While all the caves located in the Andes Mountains over 4000 metres above sea level, Qaqa Mach’ay is the highest at 4930 metres above sea level. check out the website it will be further updated in the coming weeks. The highest we surveyed was 4862 making it number 2 on the worlds highest surveyed list. Most were between 4600m and 4700m….